Salmon with Lemon and Herbs, quick, easy gourmet dinner. We like to throw a few wood chips on the coals when we grill fish. It adds a bit of smoky flavor but without the slow cooking of a 'smoked' fish. The orzo uses one of my favorite methods for an easy, summer tomato sauce: grating. This is a cross between smoking and grilling. The wood chips are optional, but we like the added flavor, especially for salmon. As always, with fish, cook until it just flakes easily, being careful not to let it on too long. You could also roast the salmon, 400F (200C) oven. If you do, add 1/2 tsp soy sauce to the lemon/herb mixture. In small bowl whisk together lemon and oil, it should get thick. 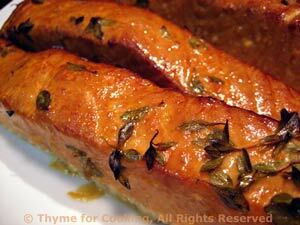 Spread marinade evenly over salmon and allow to marinate 10 - 15 minutes. Put salmon in a grill basket if using barbecue grill or on mesh grill pan or use a grill mat. Cook over indirect heat for 10 - 15 minutes depending on thickness. You might need to cover the grill for 5 minutes or so. Put on baking sheet and roast in 400F (200C) oven for 15 - 20 minutes, depending on thickness. Soak a small handful of wood chips in water for at least 15 minutes. Charcoal: Put some charcoal in the barbecue, off to one side and light it. When the coals are glowing, add the salmon, either in a basket or on a grill mat, to the other side - in other words, not over the coals. Gas grill: Only light one side of the grill. Wrap the soaked wood chips loosely in foil. Poke a few holes in the foil and place on the grill. Keep the fish off of direct heat and the grill cover closed and vented or propped open an inch or so. Cook for 10 - 15 minutes. In all cases, fish should flake easily but not be dry. Slightly pink in the center is perfect. Remove from heat and serve, sliding it off the skin if needed. When tomatoes are in full summer season I tend to use them with abandon. Grating them makes a lovely, fresh tasting sauce or addition to any food. If not available I use 1/3 cup tomato sauce. Cut the tomato in half. Cup one half in your hand and rub it on the big holes of a box (or other style) grater until all that is left in your hand is the skin. You'll have to press a bit, but not too hard. Be careful not to grate your hand. Measure the tomato and add enough chicken stock to equal 1 cup plus 1 tbs. Put into a small saucepan, add orzo, cover and simmer over low heat until all liquid has been absorbed, stirring occasionally. 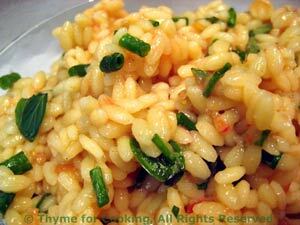 Taste the orzo to see if it's done to your liking. If not add 1 - 2 tbs water, depending on how juicy the tomato was. Stir in herbs. Total cooking time is 10 - 15 minutes, depending on the orzo. Serve hot or warm. A simple summer dish! 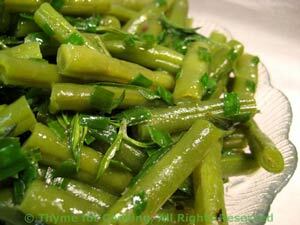 Use any fresh herbs you have, but basil, summer savory and chives are especially good with beans. Use one or any combination. Cut into 1 1/2 inch lengths (4cm). Put beans into small skillet, add stock, cover and simmer over medium heat until done, 7 - 10 minutes. If beans dry out add a little water. When done drain and transfer to a serving bowl. Melt butter in the same skillet over low heat. Snip herbs using scissors and add to melted butter and sauté briefly. Add beans and toss/stir to coat. Serve. Note: If you prefer your beans to be more on the crisp side: Bring a medium saucepan half full of water to a boil over medium-high heat. Add beans and blanch for 4 minutes. Remove, drain and immediately plunge into cold water until cool. Drain. When adding to butter and herbs, stir-fry for 1 minute to warm.